Read some of our incredible guest feedback recently posted on TripAdvisor. Read more of our reviews and see photo’s our guests have taken on TripAdvisor or Booking.com. Thank you to the team at Welgelegen Manor. It is always very special to be greeted by our friend Connie who never ceases to amaze us with her passion for people and the lovely way in which she welcomes us back each time, even walking to meet us at the plane with her beautiful smile which she just radiates. Thank you Connie. With much gratitude we want you to know that we appreciated the friendliness of all the staff. Thank you all sincerely for making our return visit to Welgelegen Manor so special. We enjoyed celebrating our wedding anniversary there again. We love the tranquillity of the Manor house, the afternoon spent relaxing at the beautiful pool area, listening to the many birds singing and chirping was good for the body, mind and soul. To Herman thank you for seeing that the landing strip was in such good condition as it was lovely to land and take off from there. I hope the fall you unfortunately had did not leave your body aching. At the beginning of a New Year may we take this opportunity of wishing all at Welgelegen Manor a happy, healthy and a wonderful year, filled with many blessings. Please keep up the high standard, as it is always a pleasure to visit Welgelegen Manor. We look forward to flying in for another visit soon. 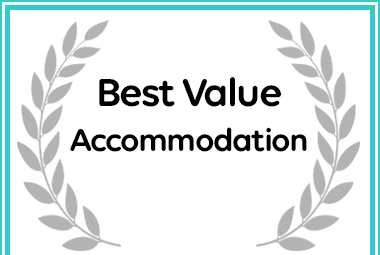 Excellent accommodation and Customer service. Ideal for relaxing and being pampered. Professional yet friendly staff. The Suites are well designed with lovely interior decor. I would go back as many times. This is my 5th visit to Welgelegen Manor and each and for every visit, I have come away feeling revitalized and invigorated! Best of all, the standard at the Manor under Connie’s very able leadership is improving…what a pleasure! The cuisine is an absolute pleasure and the chef needs to be congratulated on a job well done! Hold onto him at all costs! Thank you all at Welgelegen and I’m already looking forward to my return…hopefully sooner than later! Keep up the good work! Bought this 2 night deal on Daddy’s Deal. What a great place stuck away in Balfour. The place is amazing with a lot of history. We stayed in a garden room which was unbelievable with heated floors in the bathroom. Was huge with own dresser and although it was cold the room heated easily with the aircon. The food was delicious although we felt it was so expensive for the portions you get. Overall the staff are all friendly and helpful. Definitely worth the trip and experience. Beautiful Herbert Baker house near Balfour in stunning countryside. Own airstrip. Truly one of the most special places we have ever stayed. Superior service and very friendly. Food presentation and chef are world class. This delightful property was approached up a long unpaved road and back in time to a place where service and hospitality was to the forefront. Calm and solitude was for the taking, a restful stay guaranteed. Michael saw to our every need and anticipated many others as yet unrealized The room was a converted stable – in fact 4 stables! with an additional walk in wardrobe and huge bathroom with double shower, bath and all the normal facilities, overlooking an enclosed garden. Again calm and comfort to the forefront. The house itself consisted of a library, chess room, study and dining room built around an open quadrangle, where weather permitting breakfast could be served. The pool set to one side of the house overlooked a rose garden and beyond open landscape for what seemed like miles. We spent a very relaxed 2 days here at the end of our stay in South Africa, and were a little disappointed that this was at the end rather than the start as we would have been tempted to stay longer. A late flight back to the UK was tempered by Michael inviting us to stay late and make the most of this idyll. Old fashioned service doesn’t get much better. My partner and I had the most special and relaxing time away at Welgelegen manor. We spent a couple nights at the manor and in that time we mostly went for walks around their huge and beautiful farm, swam in the pool and relaxed in their herb courtyard, which was just outside our room. One thing that definitely stood out to me about Welgelegen manor is their service. Never have I experienced such wonderful service – Emily and the rest of the staff at the manor took such good care of us. I would highly recommend spending a couple days at this beautiful place.